Web Print allows anyone to upload and print files to any ITS printer on campus. As long as you can upload a file to the Web Print online application, you can print on campus! Many printers on campus are now equipped with the Jacks Print release stations, so you can release the print job when you’re physically at the printer. Note: If you are connected to the NAU-Guest wireless network, you must first log into the VPN. Access Web Print at nau.edu/stc/print. Log in with your NAU user ID and password. 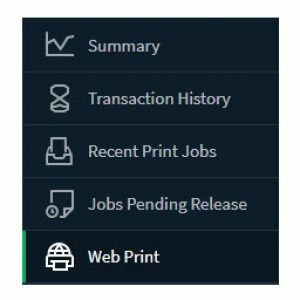 Select Web Print from the menu. Scroll to the bottom of the page and click 2. Print Options and Account Selection. Click Upload from computer and navigate to the files or drag and drop them into the window. 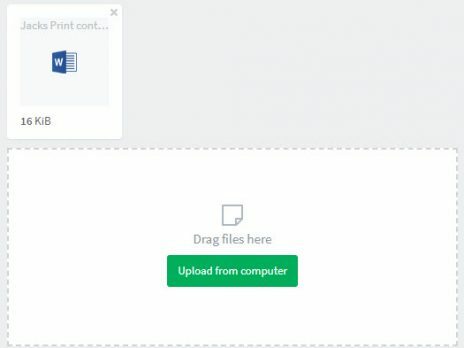 A thumbnail of the file appears when successfully uploaded. Click Upload & Complete. The document appears in the printer queue, indicates the price to print the document, and the print status. Click the button above then click Add Cash to get started. Web Print only works with the following file types.